This is the second submission by single-mom and homesteader, Mariann Foster. Click here to read her very popular first article, “Making a Life, Not a Living: A Single Parent’s Journey”. My daughter, Maria and I have enjoyed raising chickens and ducks so much that we thought we’d add a pair of geese to our flock. After watching the movie, Fly Away Home, we were even more motivated to give geese a try. We learned all that we could from researching different breeds of geese online. One of the best egg layers were supposed to be the Chinese Geese, so that seemed like a good choice. Our runner ducks gave us a good supply of eggs each Spring through Fall, giving one daily until resting up during the winter. Little did we know that the geese would add so much more value to our farm than a steady supply of large eggs. Anyone who raises poultry, can relate to the excitement of ordering your birds each year. It becomes almost a rite of Spring. Our geese ordering was no different. We carefully looked at all of the hatcheries, and decided to order. 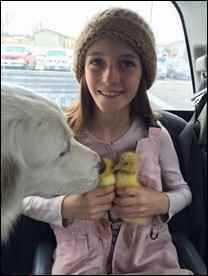 My daughter was wanting to contribute so she bought one with her money that she gets from selling her duck and chicken eggs, and I bought the other gosling. We pressed send on our online order and with excitement wrote the delivery dates on the calendar. On January 17th we put our order though. In the darkness of winter, we’d count the days down until March 21st when they were scheduled to ship out. At first it felt like it was so far away, and as the days grew nearer it felt like time slowed down. We were both very excited to receive the goslings. When we order poultry we always makes sure to call the post office that week and ask them to hold the birds at the main office in Sheridan, Wyoming which is about 30 miles away from our house. By holding them we save the birds driving around in the postman’s vehicle. It also cuts down on their travel by several hours. We started watching the weather as soon as the forecast was available. All looked ok, until severe winter weather started threatening as the days got closer. After the geese had shipped out, the forecast took a nasty turn for the worst. Our birds have always arrived on Wednesday when they shipped on Monday. This was looking to be no different. But on Wednesday morning, we didn’t get our normal 5 a.m. wakeup call from the post office to say they had our birds. I called and they assured me that no birds arrived. Our nice postmaster tracked the birds down as being stuck in Cheyenne, Wyoming which is approximately five hours away. He also informed me that he was sad to report that the interstate was shutting down and all postal employees were going to be sent home in that area. It was a bad storm and he didn’t expect the offices around Cheyenne to open for several days. I thanked him and hung up the phone. 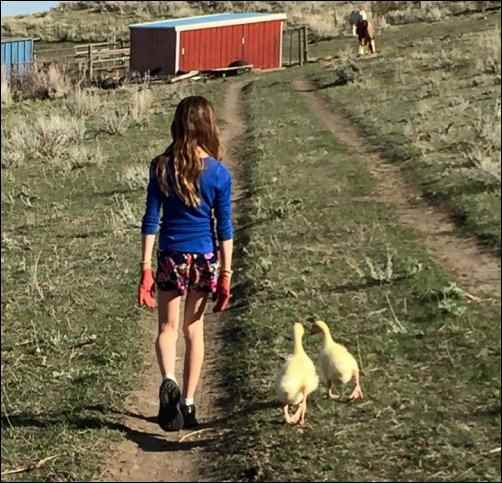 To think that our goslings would die in a box in Cheyenne was heartbreaking. Maria looked at me as I hung up the phone and I said, “All you can do is pray.” Our house is rarely totally silent but a cloud of quiet sadness seemed to loom. I had an idea to call our local postmaster again and asked him if he could ask the Cheyenne postal employees to give the goslings some water and electrolytes that I had purchased before they went home. The packet of electrolytes should be in the box. The Sheridan Postmaster asked me to wait on the phone while he used another phone to make the call to Cheyenne. He then informed that he had no idea what just happened, but that our goslings were in Casper. This was all in the matter of 5 minutes since I talked to him last. He said the tracking showed Cheyenne but they must have made the last truck out of Cheyenne and were now in Casper which is two and a half hours away from us. Maria and I knew that prayers were answered. But goslings would still be sitting in a box without proper care for one more day which is when the next truck would leave Casper. I checked the Wyoming Department of Transportation website and saw that the roads were open and looked good only to Casper where the interstate shut down the rest of the way South. Within five minutes we were in our truck, along with one of our livestock guardian dogs, Tacoma and on our way to Casper. The roads were bare and the travel was fine. It was hard to believe that the biggest blizzard of the year was going on just to the South of us. When we arrived at the Casper Post Office, the nice postal staff had been expecting us and ushered us to the Postmaster’s desk. Our geese had been given drinks and were in the warmth of the office. They were fine so far. We had our truck heat turned way up for the goslings and took time to give them more water and the electrolytes and their first feed that we had ready. All was well. My daughter held the geese on her lap for the rest of the ride home. We kept our truck heat jacked up to 90 degrees Fahrenheit. Our dog, Tacoma was doting over her new charges and watching every move they made. 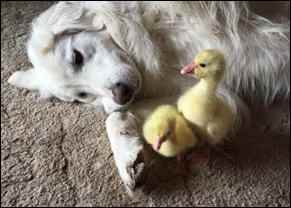 The guardian dogs all took a great liking to the goslings the moment we walked in our door. We make sure to show any newcomer to them immediately. They will kill stray cats and also wild rabbits, but they protect our cats and our angora bunnies that they know are “theirs.” It’s very important that they bond with them right away. The geese were “theirs” from the moment we walked in the door. Tacoma actually already claimed them on the ride home. As the geese grew I noticed several behaviors that were very interesting to me. They started to get a little bossy with the dogs as they grew. The dogs were tolerant to a point, but when the geese started pulling at their hair in an aggressive way, I noticed they would hold them down by their neck for several seconds. Never hurting them, but just disciplining by letting them know that behavior was not acceptable. It was interesting when I read about geese, how books would say to do that exact thing. Hold their necks for several seconds and tell them in a firm voice “no.” I was amazed that the dogs somehow already knew this. And it worked! The geese got along great with all of the dogs. They ended up being a perfect match to guard right along with the dogs. The geese would follow the dogs, lay on the porch with them, and pretty much go where the dogs went. 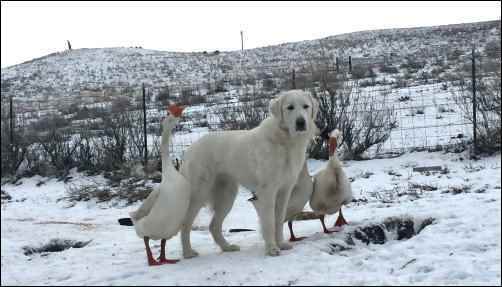 If a dog was inside and heard a goose honk, they’d run out to make sure all was well. The geese would sometimes notice things before the dogs and would honk. An eagle, hawk, fox, stray dog on a distant hill, would get the geese honking. The dogs responded every time to the geese when they would honk. When the dogs would bark at something before the geese noticed it, they would start honking. Though my daughter and the dogs were getting along great with the geese, they started charging me when I wasn’t looking. They seemed to like trying to chase and grab me with their bills. If I wasn’t paying attention they would give a little pinch. I was disappointed with this behavior because I treated them so kindly and thought they’d remember this forever. That Fly Away Home movie had me convinced that geese would be my buddies for life. But this was not the case. It didn’t matter that I hand raised them in our living room in an extra large stock tank and talked to them every day. They wanted to be the boss over me. I’d tried what the dogs did, and would hold them by their necks when they gave chase, but it didn’t seem to make my relationship with them any better. One day, my daughter handed me a book that she had written just for me. It was called, “Fixing Your Relationship With Your Geese.” She wrote about advice that she had read and about the success she had with the geese. They seemed to adore her but not me. The truth was shocking to me. Simply said in her book, was “you get out of the relationship what you put into it with your geese.” It was true I was not spending time with our geese the way she was. She’d sit and read to them outside and I’d just feed them daily and walk away. But really, I did not have time to sit and read to my geese. Apparently, they were hurt and upset that I stopped spending the time with them that I used to when they lived in the stock tank in our house. In December, a few days before Christmas an elderly neighbor couple called me and asked if I lost a goose. They said a stray and hungry looking goose was hanging around their house. Our geese were accounted for so I told them that and I thought that was the end of it. A couple of days later, a stray goose walked up our road. It was a Chinese goose, though not white like our two. I assumed it was the same one that they had called about. It was skinny and looking hungry, trying to forage for grass under the snow. Feeling bad for the goose, I tried to get him to come in to our yard. But when I got close he flew away. He flew higher and further than I realized Chinese Geese could fly. I wondered why ours never flew like that. But this one was very skinny and lightweight so that may have been the reason. Plus, I don’t think ours would leave our dogs. They were tightly bonded as one flock to our dogs. That same day, the stray goose came back. This time I coaxed him in our front yard with a bowl of water and geese food. He ate heartily and sat by our front steps. Around 11 p.m., I walked out and sat with him and then grabbed him into the safety of my arms. A lone goose wasn’t safe in this land of coyotes, fox and stray dogs. I put the goose in a large dog crate for the night in our greenhouse so he’d be safe. By morning I opened the greenhouse door and sure enough our two geese came to investigate. Later that day I let the goose go in our back yard with our geese. He fit right in from the moment they met. 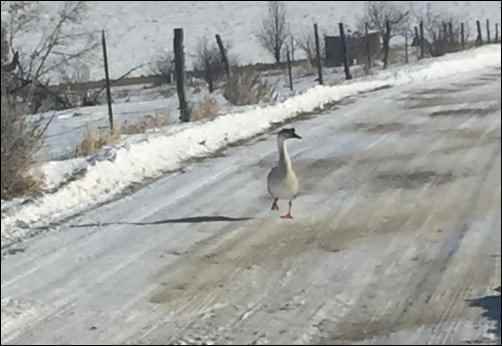 I called neighbors and put a notice on Facebook about the lost goose. No one claimed him nor knew of anyone that had this type of goose in our area. We couldn’t just turn him loose so we named him Chris, the Christmas Goose. He has been here ever since. Never trying to fly away. And thankfully, Chris likes me. A lot. He seems to know I rescued him or maybe he’s just a nice guy. Despite the name of this section, we didn’t eat any Christmas goose this year. Chris became a buddy to the dogs too. And I think he helped the other geese to see I was pretty cool. They’ve been much nicer to me since Chris arrived. The geese have taught me that some relationships take patience. They also taught me that geese are incredibly smart. Geese have a lot of body language going on and calls, that I was never aware of until geese joined our farm. They also taught me that they have a lot to give back to our farm as guardians. I feel like with our donkey, the guardian dogs and now the geese, nothing is stepping on our land without me knowing about it. I also learned that geese are too pushy to be housed with the ducks. And that they are timid around the chickens. So they go into the chicken pen at night with the chickens. During the day the geese, chickens and ducks all forage in the same large fenced backyard, but the ducks keep their distance. The three geese are enough for our farm at least for now. Apparently the geese take a few years to calm down until they are true friends with their humans. That we shall see. Maybe I’ll have the Fly Away Home geese friends that I was hoping for. For now, I still watch my backside when I walk by them. Though they are much better since Chris arrived, they still like to surprise me once in awhile with a little nip. Makes me want geese. I love your dogs! Hi Sellie. Sorry, that I just noticed your comment. Geese are fun and very smart. And I can’t imagine life without out dogs. They are family to us. Mariann I loved your article about your goslings . What a beautiful story with your daughter. I bet those goslings imprinted on your daughter. My son 4H teen poultry leader read several articles on goslings and imprinting. When we got our 3 goslings last June at the post office he sat with them hours each day and they would follow him and his girlfriend around . We have a pair of Pilgrim geese and an Embden female. New are getting goose eggs now which is so exciting. Last year we lost our beautiful Brown China goose to a early evening bobcat attack. He was trying to save his two duck friends. We nursed him and eventually he passed away. I did notice the brown china was more aggressive than the pilgrim geese we have now. How are you geese doing? I love how you took in the stray brown china. You are very kind.